A customer in New England approached the local Keyence representative with a special request – they wanted to mount a first order retardation plate (also known as a full wave, red, red-one, first order red, gypsum, or lambda plate) on their Keyence VHX-6000 digital microscope with the VH-ZST dual magnification lens. 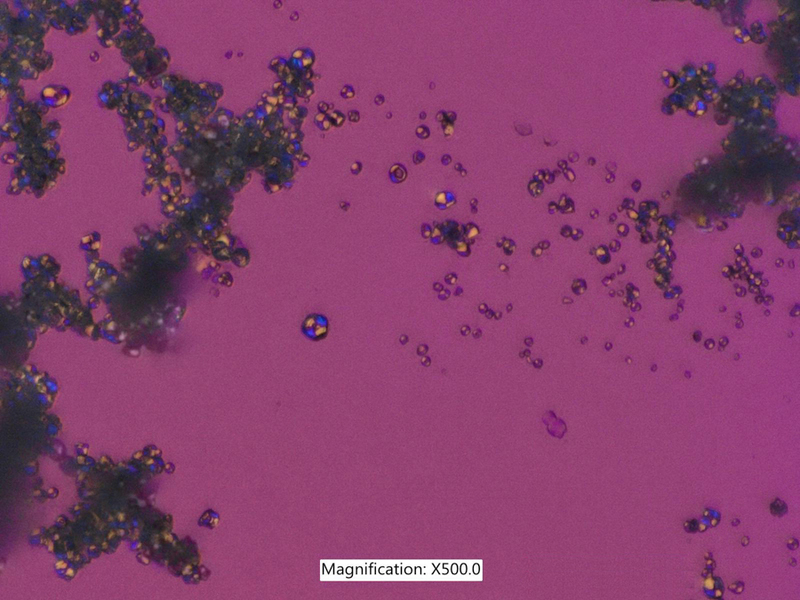 Retardation plates like this are commonly used in combination with crossed polarizers to detect and highlight birefringence. 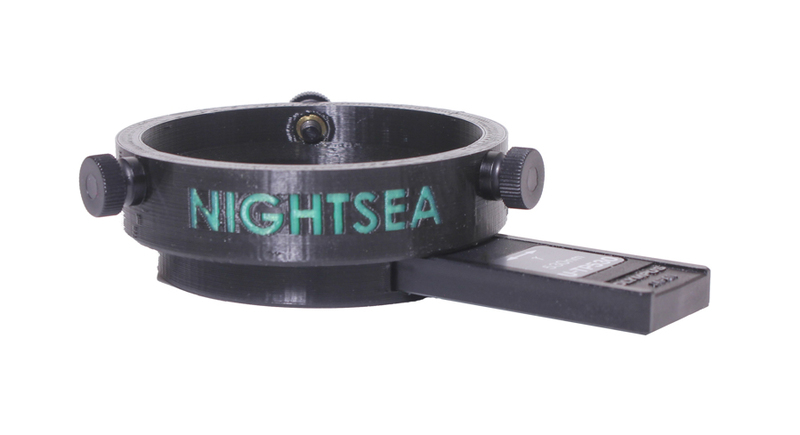 Keyence already offered a rotatable polarizer that mounts on the microscope stage and a second above the objectives, but did not have a provision for adding a retardation plate. We had worked closely with the local Keyence rep in developing solutions for adding fluorescence to the Keyence microscopes, and she approached us with this new challenge, despite the fact that our expertise is fluorescence and we did not know much about polarization and retardation plates. We got a fortuitous boost up the learning curve while attending the wonderful annual Inter/Micro Conference at McCrone Research Institute (links at end of article). During one of the presentations a red plate image of the birefringence of starch appeared on the screen! I approached the presenter for more information, and after that the very helpful microscopists at McCrone gave me a mini-education on the use of these plates. 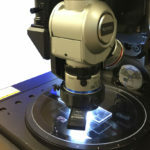 I learned how they were typically installed in a polarizing microscope, and also that they were always mounted in a DIN standard 20 x 6 mm cross-section holder. 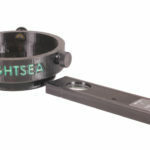 While compensators are normally installed at a fixed 45 degree angle relative to the crossed polarizers, the customer wanted the plate to be rotatable. We formulated a design approach and proposed it to the customer. 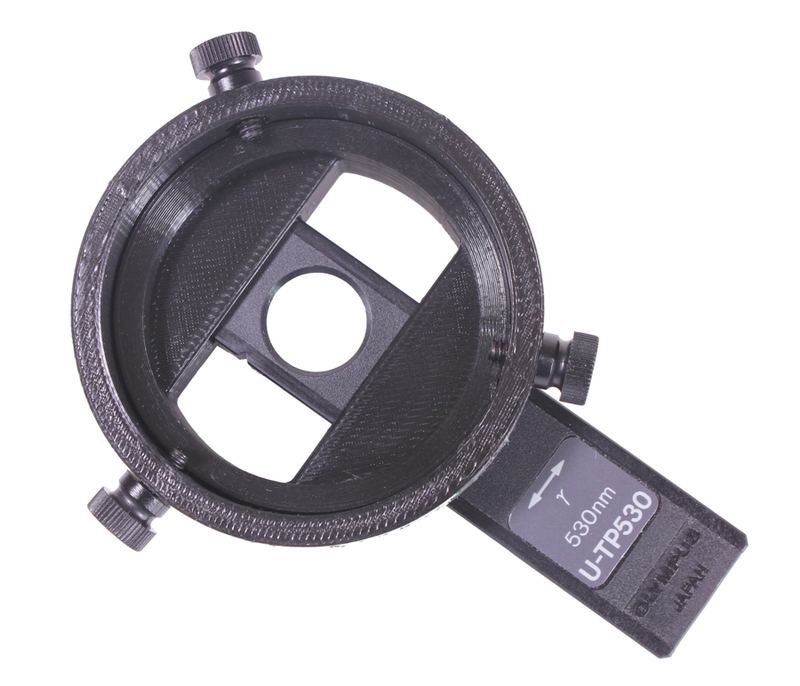 They accepted and provided us with an Olympus model U-TP530 first order red plate to aid in the development. 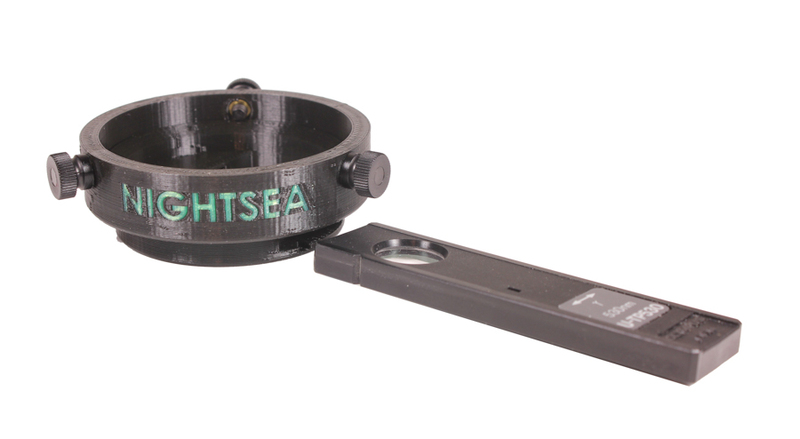 We designed a two-part holder and manufactured it using 3D printing technology. 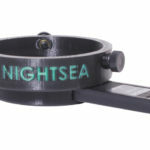 One part, the lens adapter, slips over the Keyence VH-ZST lens and mounts with plastic thumbscrews. 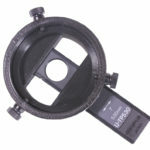 The other part, the red plate holder, rests on a lip on the inside circumference of the lens adapter and is freely rotatable. The red plate inserts into a shaped cutout on the outside surface of the holder, passes through the center, and then into another cutout with a fixed depth. This positions the plate directly beneath the Keyence objective. The delivered system is now in use at the customer’s facility. 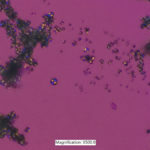 The images below show: a red plate next to the NIGHTSEA adapter; the red plate inserted into the adapter; the same from above, showing the central positioning of the plate; the adapter and red shift plate in use on a VH-ZST lens; and a birefringence image of corn starch, showing the characteristic ‘Maltese cross’ pattern. We had great help in executing this project. Special thanks to Alik Apelian (Keyence), Sebastian Sparenga (McCrone Research Institute), Skip Palenik (Microtrace), and of course the customer (who wishes to remain nameless, as so many do).